Micro Harmonics announces the availability of high performance MMW isolator products for applications requiring superior isolation and low insertion loss. 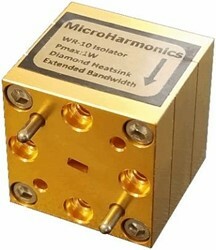 The initial standard product offerings from Micro Harmonics are available in WR-12 (60-90 GHz) and WR-10 (75-110 GHz). Both models work well over frequencies outside of the standard waveguide bands. The WR-12 isolators have remarkably low insertion loss (< 1 dB) in the popular WR-12 sub-bands 71-76 GHz and 81-86 GHz. Power handling exceeds the current state-of-the-art due to the implementation of diamond substrates to channel heat to the waveguide block. Micro Harmonics has also developed a drop-in isolator topology comprising a center plate that houses the core assembly and an E-plane split waveguide block containing a stepped waveguide twist on both the input and output ports. This topology can be used as a standalone component or the center plate can be removed and integrated into a larger system. Micro Harmonics will provide the CAD drawings for implementation of the drop-in isolator into the customers system and provide a reimbursement for the returned outer housing. These precision ferrite isolator products were developed in part by SBIR funding for use on future NASA programs requiring critical sensor and detector technology for submillimeter missions. Commercial uses include scientific instrumentation applications such as plasma diagnostics, chemical spectroscopy, biomaterial analysis, and radio astronomy. Micro Harmonics specializes in ferrite based MMW components. The company was founded in 2008 as a research and design consultancy for microwave, millimeter-wave and sub-millimeter-wave components. Micro Harmonics is developing an advanced line of Faraday rotation isolators and circulators in bands from WR-15 through WR-3 (50 to 320 GHz). Data sheets can be accessed at the link below. Micro Harmonics is located in the beautiful Blue Ridge Mountains of Southwest Virginia.